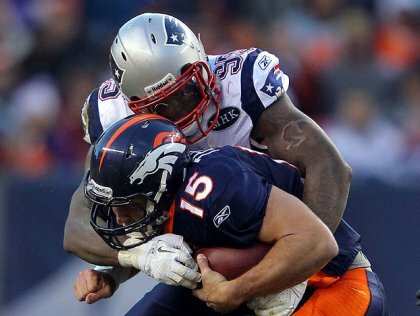 The pic to your left summed up Sunday for Tim Tebow - sacked 4 times by the Pats D. New England proving that while Tebow and the Broncos may be on the rise, Tom Brady and his crew are the team to beat right now. While Tebow got worked over, he made some solid passes, especially in the first half - drilling Eric Decker on a perfectly thrown slant pass and hooking up repeatedly with the vastly underrated Demaryius Thomas (still not 100% after the torn Achilles). Reality check: the Broncos aren't going anywhere of major significance this season but with another solid draft and Tebow's continued improvement as a passer - they'll be a fun act to watch for seasons to come. Big thanks to my former co-worker and Packers guru Lance Allan for the pregame tip that the winds at Arrowhead were fierce. Rolled the dice on the Chiefs upset thinking Kyle Orton would be juiced and the winds would temper GB's passing attack. Both things happened so now the Packers can focus on simply becoming Super Bowl champs - the only thing that truly matters - ask the '07 Patriots. Biggest winner on Sunday? The team that didn't play - the Cowboys. After crushing the now pathetic Buccaneers, their NFC East mates the Giants got dominated by the Skins. Dallas now owns a one-game lead in the division. Rookie of the Year? While Denver's Von Miller (11.5 sacks) is in the conversation, it's undoubtedly Cam Newton. The number one pick has thrown for 3700 yards and 17 TD's - keeping the Panthers competitive throughout. The Eagles sudden surge is a double kick in the groin to its notoriously nasty fan base - expectations of the Super Bowl now look justified - great timing boys. The Chargers and Raiders are still alive for a playoff spot??? Petitioning the NFL for a playoffs contraction.